Our wood Rocket Light Switch Plate Cover is perfect in a kid's outer space theme room or nursery. It is laser cut & engraved in 1/4" mahogany or light maple wood. 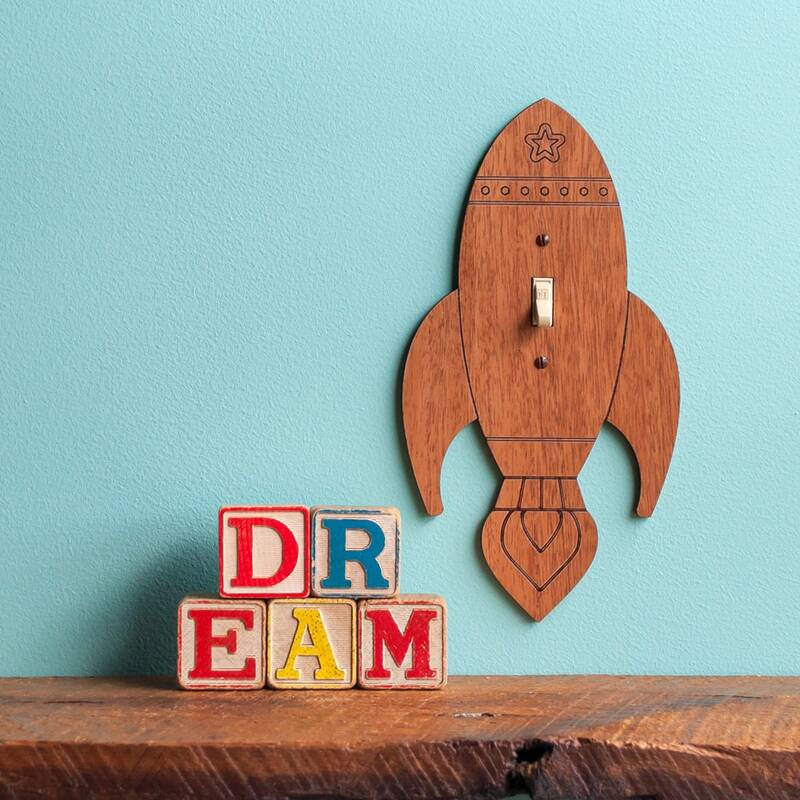 Rocketship is our original artwork and Graphic Spaces design. It is perfect in a fun office setting or as a gift for your favorite Sci-Fi fan! and is routed out on the back to fit perfectly over any electrical box. Screws included. It's everything you need right from the package! Please note that because our products are individually handmade of wood, the natural wood grain pattern will vary with each piece. This adds distinct beauty and character to each design. Graphic Spaces is a small family business known for our cute, wholesome and happy artwork combined with fine-detailed, quality craftsmanship and beautiful finishing techniques making our pieces dearly loved special heirloom classics. Since 2009, our creations have become highly collectible, with new designs added every year. Your whole family will adore our products and delight in coming back year after year as your family tree grows. All artwork and images are original and the copyrighted property of artist and designer Christy Austin, owner and founder of Graphic Spaces. These images are fully protected by United States and International Copyright laws, all rights reserved. Art may not be stolen, traced, copied, reproduced, manipulated, or used in any way for commercial or personal use. Unauthorized usage and/or reproduction of said artwork and images constitutes copyright infringement and is a violation of federal and international law. Offenders will be prosecuted to the fullest extent. Love it! It looks really nice and it was the perfect addition to my son's room. Beautiful light switchplate - nicely made - looks great! It arrived quickly and is perfect for our baby's room! Thank you! Picture perfect, and super fast arrival!